After endless consultations and arguments, with almost a dozen options being tabled and rejected, eventually a location was found over a mile and a half away to the west that was chosen for the new Visitor Centre. The A344 road past the monument was closed and grassed over, the old facilities and car park decommissioned and in December 2013 the new centre opened. Designed by an Australian firm Denton Corker Marshall, with an initial budget of £27M, the intention was to create a building that sat quietly in the landscape and deliberately didn’t reference the form of Stonehenge in any way. Its elegantly curved roof was to evoke the sense of a leaf lightly resting on angled columns that called to mind the trunks of trees in a wood, with dappled sunlight falling through the perforations at the roof’s edge and a gentle breeze cooling the central corridor between the two independent building “pods” below it. For those that geek out on these things, there is one direct reference to Stonehenge – the tallest columns supporting the roof at the NE and SW corner are each the same height as the tallest trilithon at Stonehenge was when first erected 4,500 years ago. There are two major advantages over the old centre – firstly, the café is now indoors and secondly there is an excellent exhibition which showcases artefacts from both the Stonehenge landscape and the monument itself. Entrance to the exhibition is included in the ticket price and this part of the Stonehenge experience definitely shouldn’t be missed – it helps to place the monument in context without overwhelming a casual visitor, but has enough detail to interest the nerdiest Stonehenge enthusiast. There is a walk-in 360° video theatre which places you in the centre of the monument at all the major stages in its development, from 3000BC when the henge bank and ditch was dug along with the Aubrey Hole circle of 56 post or stone holes, through the arrival of the large Sarsen stones around 2,500BC, the final rearrangement of the Bluestones in 2,200BC and the 3 minute presentation brings you up to the modern day appearance complete with traffic flowing by on the A303. As the seasons change, you see representations of both summer solstice sunrise and winter solstice sunset as shadowy – almost ghostly – figures process around the circle. Passing through into the main exhibition space, you find five display cases containing genuine archaeological finds that are on loan from Salisbury Museum and Wiltshire Museum (in Devizes) including some of the grave goods – flint arrowheads, bronze daggers, gold, amber and jet jewellery as well as ceramics – from the burial mounds along with the remains of two occupants. Both museums offer reduced price entry to Stonehenge ticketholders and each have recently enjoyed major upgrades to their own exhibition spaces. On one side is a huge dynamic video wall showing the evolution of the landscape and the sites of its key monuments over time, along the other are four large bronze models of Stonehenge at the main points in its evolution (feel free to touch the models, it’s encouraged). As well as the permanent exhibition, there is a side gallery which houses temporary displays that are periodically replaced. 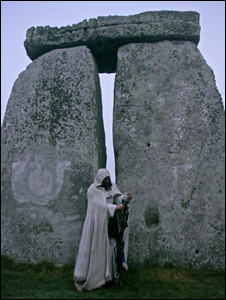 Presently, the side gallery contains Julian Richards’ “Wish You Were Here” exhibition of Stonehenge collectibles and memorabilia down the ages, from postcards through Druidic regalia and some bizarre items that have used the Stonehenge image as part of their marketing. This includes phone cards, stamps and a wonderful brass Trilithon-topped crumpet-toasting fork. No such collection would be complete without a copy of the Spinal Tap Trilithon-shaped single record, and sure enough it’s here too. Staff and volunteers in the exhibition are happy to explain the items on display in the main hall and the side gallery, so don’t fail to take advantage of their knowledge. These houses were built by experts from the Ancient Technology Centre on Cranbourne Chase and a cohort of keen volunteers, some of whom can often be found in the houses giving demonstrations of ancient skills. It’s only by attempting to replicate the work of our long-dead ancestors that we gain new insights into the subtler aspects of their lives – the houses (not mere “huts”) are spacious, comfortable, sturdy structures and with periodic maintenance will easily last 25 years or more. The new Visitor Centre may be a building that divides opinion, but within and without there are some fantastic displays that give a genuinely fresh perspective on Neolithic and Bronze Age life. Just outside the visitor centre, at the back, sits the collection of replica Neolithic houses that are closely based on the remarkable archaeological discovery of such buildings at nearby Durrington Walls – the probable settlement site in use when the large Sarsen stones were being erected 4,500 years ago. Entrance to Stonehenge is now managed through timed tickets and advance booking is the only way to guarantee entry on the day and time of your choice. By booking in advance you will also benefit from an advanced booking discount. It is also possible to purchase advance Stonehenge tickets here to beat the lines. If you are short on time and would like to join an organised guided tour of Stonehenge, it is possible to do this from London, Salisbury or Bath. You can even arrange for local expert guide to meet you at the visitor centre for a guided walking tour.